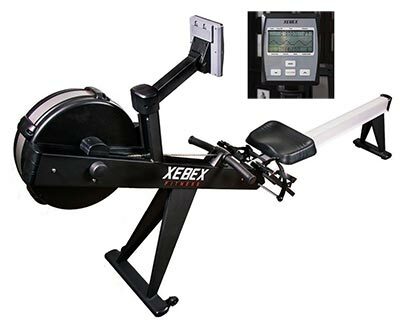 We compared them side by side and concluded the Xebex Air Rower AR1 is better than that Concept 2 Model D and the Concept 2 Model E. So we've switched to offering the Xebex Air Rower! The Xebex has a higher seat height, making it easier to get on and off. It's heavier and more stable in use. The seat is more comfortable. The foot holders are easier to change. The fan is great. And most importantly the return of the row is smooth as butter. • 95lb heavy duty frame (heavier and more stable than most rowers) is built for commercial and home use. • 55” monorail is sure to accommodate legs of all lengths. • Air resistance with damper settings allows you to change resistance from 1-10. • Chest strap compatible, but not included. • Seat is 21” from ground to allow easy access on and off of the machine. • Extra padding on seat provides a comfortable workout. • Extra padding on handle ensures a no blister routine. • 1-touch adjustment on footing to accommodate all foot sizes. • Simple fold-up design cuts the horizontal size in half for easy storage. Includes wheels for easy transport. • Large LCD monitor with big buttons. • Programs allow you to set distance, calorie or time targets. Oops, something went wrong with this transaction. A FitDel employee will contact you to resolve the issue. Please do not fill out the order the form again. How did you hear about FitDel? Please enter your phone number in case we need to contact you. We do not require deposits. However, we do require the following. Yes Are you tax exempt? Note: you may change to another card or direct deposit later. Oops - Your credit card was declined. Please check the information you entered and try again. If you continue to have issues, please call 512-687-3161 for help. This is the security code on the back of your card. Usually 3 digits.